(Albany, N.Y.) – Young credit union professionals across New York will have access to networking resources, professional development opportunities and industry events in 2014, thanks to a generous donation from CUC Mortgage Corporation. The full-service mortgage corporation has donated $50,000 to the New York Credit Union Foundation to support initiatives that engage and empower young professionals/volunteers within the New York credit union community. The initiatives are led by the Credit Union Association of New York's Young Professionals Commission, which was founded in 2010. Commission members (a group of 20 young professionals nominated by their credit unions and selected by the Association) host frequent regional networking/education sessions, publish a quarterly newsletter, maintain an active email network, Facebook community and website, and host special events at the Association's annual conventions and governmental affairs conferences. All Commission initiatives are open to credit union professionals/volunteers age 35 and younger, and industry veterans are often included to promote mentoring and cross-generational cooperation. "CUC Mortgage is deeply invested in the credit union movement and in the success of the credit unions we serve. Cultivating and retaining future leaders is a goal all credit unions share, and the Foundation and Young Professionals Commission are making a real impact in that area," said CUC Mortgage COO Edward Kovalefsky. "Our donation is an investment in their continued success—and it's an investment that will benefit the entire credit union movement for years to come." In 2010, CUC Mortgage donated $25,000 to the Foundation to help fund the launch of a statewide young professionals network. "The Foundation is proud to support initiatives that strengthen our statewide network of young professionals and volunteers, and we wouldn't be able to do it without this generous funding from CUC Mortgage," said Allison Barna, VP of the Foundation. "Thanks to their donation, we can continue to engage and empower the next generation of credit union leaders." CUC Mortgage, headquartered in Albany, N.Y., and licensed in New York, New Jersey, Connecticut, New Hampshire, Pennsylvania and Vermont, is a full-service mortgage corporation committed to serving credit unions in the greater Northeast. Every aspect of the organization's mortgage program, which promotes growth and increased revenue, is customized to meet the unique needs of credit unions and their members' dreams of home ownership. To learn more, visit www.cucmortgage.com. Albany, N.Y. – The New York Credit Union Foundation (NYCUF) recently partnered with Cornell Cooperative Extension to train New York teachers and community volunteers on the National Endowment for Financial Education's (NEFE) High School Financial Planning Program (HSFPP). The organizations hosted training sessions July 18 at The Summit FCU in Rochester, N.Y., and July 23 at Teachers FCU in Hauppauge, N.Y.
Nearly 30 educators and credit union professionals completed the daylong trainings, which prepared them to teach the award-winning, recently updated HSFPP curriculum to youth in their area schools and community groups. Cornell Cooperative Extension Trainer Barbara Henza reviewed each of the curriculum modules, which include: planning, borrowing, earning capability, investing, financial services and insurance. She also outlined the program resources available to educators, including: student guides, teacher lesson plans and a growing collection of online resources and learning activities. 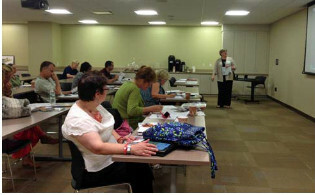 "Attending this seminar was hugely helpful because the financial literacy curriculum provided through NEFE is excellent. It follows state and national education standards, but, more importantly, it is presented in a fun, logical and enjoyable way," said attendee Jackie Wiegand, marketing administrator at Compass FCU. "My plan is to share the seminar's resources with an area teacher and to use NEFE materials for credit union workshops and any guest presentations in our local schools." The HSFPP curriculum is used by credit unions across the state, with many providing free curriculum materials to area schools and/or teaching the financial literacy workshops themselves. According to the Credit Union Association of New York, the state's credit unions educated more than 35,000 youth through financial literacy programs last year. "Our Foundation's mission is 'fostering the financial independence of New Yorkers through credit unions,' and building youth financial literacy is a critical part of that," said Allison Barna, director of NYCUF/community development. "We are proud to partner with NEFE and Cornell Cooperative Extension to bring HSFPP resources to New York credit unions and educators." For the past four years, NYCUF has partnered with Cornell Cooperative Extension to provide NEFE HSFPP trainings across the state. The organizations are planning to host another session this fall.